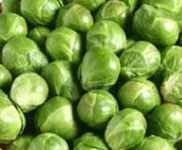 Brassica oleracea; Full sun, Plant height: 2-3ft.. Brussels Sprouts do best when planted in the early spring or late fall as the plants prefer cool temperatures. Several light frosts actually improve the taste. Catskill (90-105 days) Yankee heirloom used mostly for fall crop. 1 1/2 in. sprouts. Dwarf to semi-dwarf plants. Long Island Improved (100-115 days) Heirloom variety taking its name from the place of origin. Vigorous, compact plants produce dozens of dark green sprouts 1-1/2in.